Ged Walker delivers the majority of our Graffiti and visual art workshops. As well as being a freelance Graffiti artist and workshop deliverer, Ged also works for Artworks Creative Communities, the partner organisation in the creation of the PiPeLine Productions Academy for the Hip Hop Arts. Ged and Philip worked closely on the writing of the funding bids that enabled us to bring in the money to make the Academy happen. In this short video, Ged is having a play on the prototype for our Digital Graffiti screen. Because budgets were so tight we had to source cheaper DIY alternatives to produce a rear projection screen. Aside from the screen being a little flappy, something we’ve managed to rectify to a good degree, the screen does the job pretty well! Well, 2009 this was, Philip, Marcus and Ben delivered a workshop for Creative Partnerships in a primary school in Bradford. The aim was to improve literacy and higher language skills in primary school pupils, particularly pupils for whom English was perhaps a second language. The project, which spanned several months, involved getting the pupils to explore new words to help them describe feelings and situations using more complex language with a view to improving imagination and higher order thinking skills. We then explored the new language to retell a popular film through the medium of rap. The pupils chose Home Alone as the film they wanted to work with. Having watched the film, they then wrote rap lyrics to retell the story, all the while incorporating words they had explored earlier in the program. Robbery Not Theft is a short film produced by Philip and Marcus from PiPeLine Productions through our work with Nacro and the Bradford Youth Offending Team. On Thursdays we run a creative program for young people on the intensive surveillance and supervision program. Within this program participants try their hand at all manner of art forms, film production being one of them. This film was shot over about 4 weeks at various locations in Bradford. 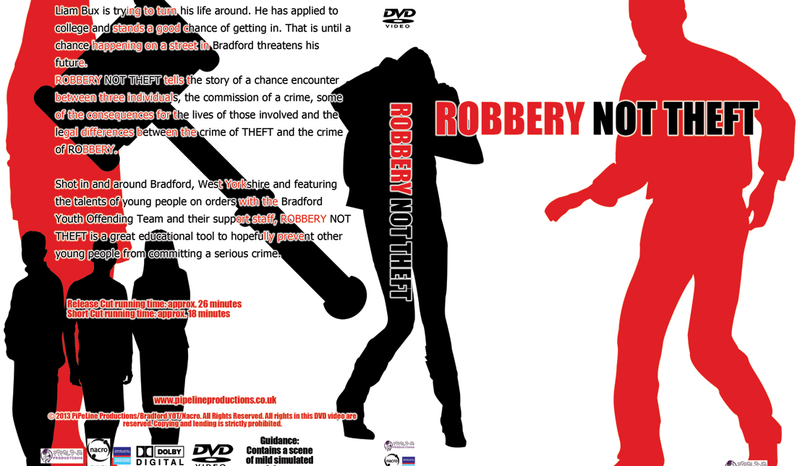 The DVD and its accompanying workbook and poster was used in schools to highlight the difference between the perceived crime of Theft and the actual crime of Robbery. A theme was chosen in line with the Youth Offending Team’s education priorities and then the participants sketched out some scenarios which would enable us to tell the story with an educational message. So, as actors, they knew what needed to happen in each scene along with some key things that needed to be said but in order to achieve this, they improvised their scenes, making up the dialogue as they went along. Some of the songs used in the film were created in the studio by the participants themselves and the foley artistry (the added sounds such as cars driving past, footsteps on a wooden floor, sipping a drink etc.) were all done in house and added to the film in post production.